Cases and Materials on Criminal Law provides a comprehensive selection of key materials drawn from law reports, legislation, Law Commission consultation papers and reports, and Home Office publications. 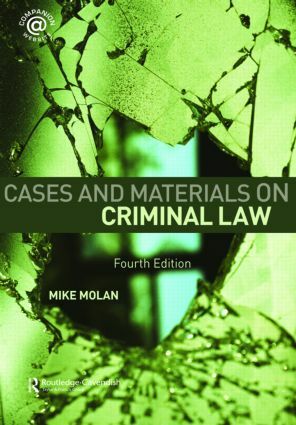 Clear and highly accessible, this volume is presented in a coherent structure and provides full coverage of the topics commonly found in the criminal law syllabus. The range of thoughtfully selected materials and authoritative commentary ensures that this book provides an essential collection of materials and analysis to stimulate the reader and assist in the study of this difficult and challenging area of law. a Companion Website to provide regular updates to the book. Recent decisions of note that are extracted and analysed include R v Kennedy (manslaughter based on supply of heroin); Attorney General for Jersey v Holley (provocation); R v Mark and R v Willoughby (elements of killing by gross negligence); R v Barnes (consent as a defence to sporting injuries); Attorney General’s Reference (No 3 of 2004) (accessorial liability) and R v Hatton (intoxicated mistake in self defence cases). Consideration is also given to the likely changes to the law relating to corporate manslaughter, at the time of writing contained in the Corporate Manslaughter and Corporate Homicide Bill currently before Parliament. Two major law reform publications are extensively extracted and contextualised in this 4th edition - the Law Commission’s report on Murder, Manslaughter and Infanticide (Law Com No 304) and the Law Commission’s Report on Inchoate Liability for Assisting and Encouraging Crime (Law Com No 300). This book is an invaluable reference for students on undergraduate or CPE/PG Diploma in Law criminal law courses, particularly those studying independently or on distance learning programmes.